A Nation investigation found startling medical neglect inside privatized, immigrant-only federal prisons. Both Bernie Sanders and Hillary Clinton say they would end these, and all, private prison contracts. Senator Bernie Sanders has pledged if elected president, he’d end the practice of contracting with private corrections companies to operate federal prisons set aside for non-citizens, a campaign spokesperson told The Nation. The statement came in response to an investigation by Seth Freed Wessler, published in the Feb. 15 edition of The Nation magazine. Wessler uncovered negligent medical care that likely contributed to the deaths of dozens of immigrants inside a little-known sector of the federal prison system. Hillary Clinton’s campaign did not respond to a request for comment, but has previously said she’d end private contracting for immigrant detention broadly. “And he’s not afraid to say this, because he’s never gotten money from private prisons in the past,” Andiola said, in a jab at Hillary Clinton, who pledged to stop accepting money from private prison companies last October only after protests and criticism from immigration activists. Clinton’s campaign made that announcement at the same time that Clinton also pledged to end the practice of contracting with private companies to run both prisons and immigrant-detention centers. She “believes that we should not contract out this core responsibility of the federal government,” Clinton campaign spokesperson Xochitl Hinojosa said last fall. 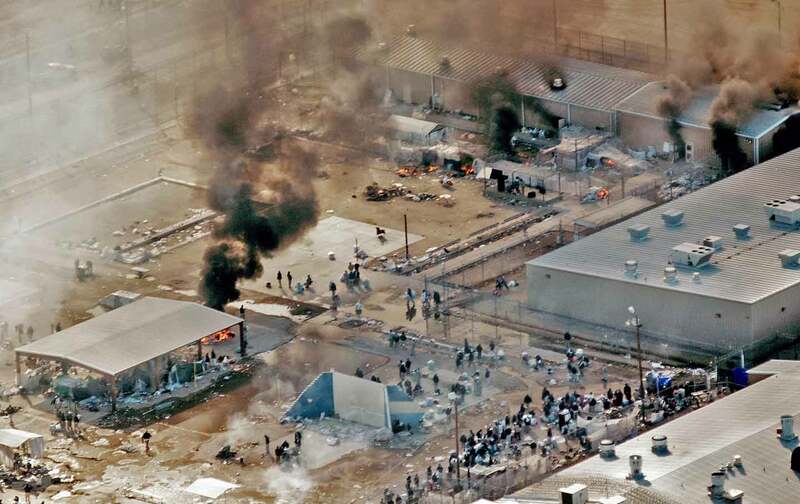 Privately run prisons and immigrant detention centers have attracted growing criticism and protest because they create a perverse financial incentive to keep people incarcerated. Indeed, the eleven privately run federal prisons that currently house almost 23,000 non-citizens are managed by the three largest corrections companies in the country, two of which are publicly traded. Privately run prisons ostensibly offer cost-cutting advantages, but Wessler’s investigation raised questions about whether those savings have actually materialized and whether they come at the cost of inmate’s lives. In a review of the medical files of seventy-seven people who passed away while in custody between 1998 and the end of 2014, an independent panel of physicians found that inadequate medical care likely contributed to premature death in at least one-third of the cases. These prisons, distinct from immigrant detention centers, are set aside specifically for deportable non-citizens who are serving criminal sentences, typically for the crime of illegally re-entering the United States after having been deported previously. They’ve grown in scope since the late 1990s, and despite closer public scrutiny over the private corrections landscape, this segment of the incarceration world remains largely hidden from public view. Below is an infographic developed by Programs Not Profits, a campaign to end privatization in the criminal justice system. 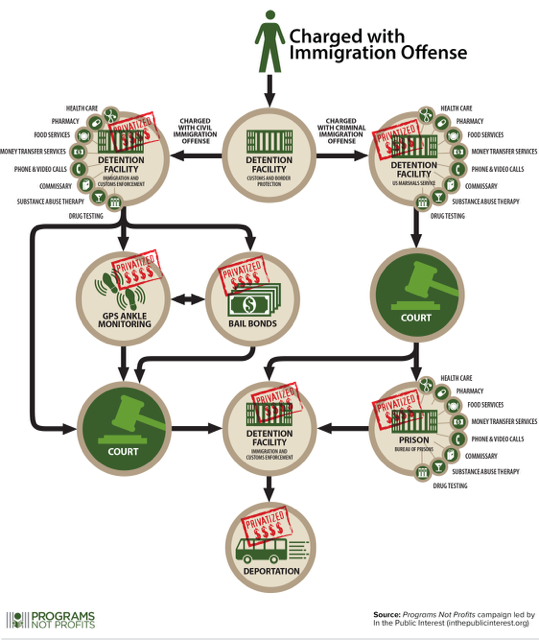 It details the ways in which immigration enforcement funnels migrants into for-profit facilities.